January 15th, 2003; A day that will live long in the memory. Myself and my good friend P.G were backpacking our way through New Zealand, and found ourselves in the small alpine town of Franz Josef. The stunning area just begs to be explored, and on this cool clear morning, we set out on our half day hike on Franz Josef Glacier. Despite the icy landscape, the sun was warm, and along with a dozen other hikers, we made steady progress up and over the ancient ice. Our group were slow, intent on enjoying the moment and the majestic views. Besides, to traipse over seven miles of ice more than 7,000 years old was somewhat surreal. It made me feel more than a little insignificant. We pressed on, and at one point had to crawl through a carved tunnel onto a large ice shelf. But because our contingent were slow, other more speedy groups caught us up. The ledge soon became crowded, shuffling us towards the outer edge. There were carved steps off to the side, but it was slow and treacherous going for hikers to descend them, and as more and more bodies squashed onto the platform, it became a little dangerous. I squeezed toward the edge in an effort to ease the crowd. Due to the raised lip, you couldn’t really see the drop beyond. For the icy terrain we had to wear crampons, great clunking bear traps strapped to our feet. I for one was not agile in them. They became tangled. And then, as if in slow motion, I fell back into the void. It’s very difficult to explain quite what went through my mind at that moment. First, falling backwards, all I could see was bright blue sky above. But when I heard the screams, I knew was about to die. Two girls, along with P.G, saw me disappear over the side. For all they knew, the drop was infinite. It wasn’t. But it was close to fifteen meters, a long fall onto ice as hard as concrete. When they scrambled to the edge, they couldn’t believe what they saw. There I was, far below, standing just a few feet from the edge of a second, deeper drop. Glaciers are shaped by erosion, resembling a series of giant waves. I had hit the ice on a down slope, the face of the wave, skidded on my back, and somehow ended up on my feet. My sunglasses were still in place. I was very, very lucky. P.G and I were sharing one backpack between us, with only water and jackets inside. It was his turn to tote the bag, but for no reason at all, I vehemently insisted on consecutive turns. To this day, we still don’t know why. But when I hit, I landed on that backpack, and it broke the fall a little and prevented me from smashing my skull on the unforgiving ice. The only damage was a badly shredded arm and a cracked heel. And that’s when it struck me just how lucky I was. 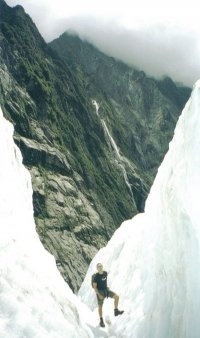 I was in shock, which helped keep the pain away, but the long walk down the glacier was slow and arduous. Our somber group, hushed because they’d almost seen someone die, made careful, silent progress. Every minor slip on the now easy descent brought nervous chuckles. By the time we made it back to the tour office, I was in quite a state. The staff treated me with basic first aid, but what I needed was a strong drink. P.G and I made it swiftly back to our hostel bar, and within minutes several large gin and tonics were downed. P.G had been through it, too. 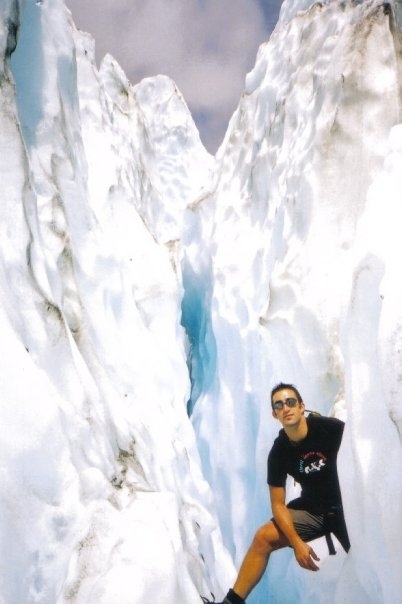 After all, it’s not everyday you see a good mate disappear over the edge of a glacier. Once our nerves had calmed, we talked about the experience. As the night wore on and the drinks flowed, the fifteen meters that I actually fell soon became twenty, then thirty, and every time we told the tale, it got more and more embellished. We had drunkenly turned ourselves into celebrities. That night, our day on the glacier got labelled ‘Life Day.’ Truth was, I could easily have died, or at least broken my back during the fall. But I didn’t, and I know how lucky I was. P.G and I vowed back then that on January 15th every year, wherever we are in the world, we would raise a glass to Life Day. Eleven years on, we still do. ps: sorry for the tiny grainy pictures…it was a long time ago. I like the sound of that; life day. Cheers. Cheers Sally. Let’s chink our cafe au lait cups in Paris, too. Yes I’ve had my fair share of scrapes, no doubt, but that was perhaps my nearest ‘near death’ experience, and one I don’t want to repeat anytime soon. I still have scars on my arm all these years later. Yeah, I’ve had a few scrapes like that, and it definitely makes you appreciate every moment.